Who's ready for Devon's biggest day out? Staged at Westpoint in Exeter, be ready to experience a giant celebration of country life and Devon produce through country competitions, local food and drink, traditional entertainment and masses of crafts. Originally a farming show, the event has grown into so much more. 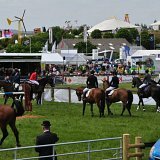 Enjoy a day at the show and overnight accommodation. This offer is based on two guests sharing a double/twin room and includes bed and breakfast and one, one day ticket per person. Tickets will be given to guests upon check-in at the hotel. We have only a limited number of tickets, so please book early. The biggest celebration of country life in Devon and the biggest event on the counties calendar. Staged at Westpoint in Exeter, the show will be full of country competitions, local food and drink, traditional entertainment and masses of crafts. It's still an agricultural show with farming in its heart, where everyone can come to discuss livestock, see the latest in farm machinery and equipment and share everything else that makes up life on a farm. But then on top of that are so many more layers. Food and drink make up a big part of the day, as Devon farmers, shops and factories come to sell their delicious local produce. Craft stalls are a chance for Devon individuals or small companies to sell their goods. Plus the family-focused fun and games keep everyone amused. The shows and competitions are always worth seeing, along with the many other displays and demonstrations, from classic cars to exciting bike jumps. Whatever it is you love about Devon, you'll find it at The Devon County Show. Get your tickets online to avoid the queues.